I love how pretty everything looks right after a snowfall. 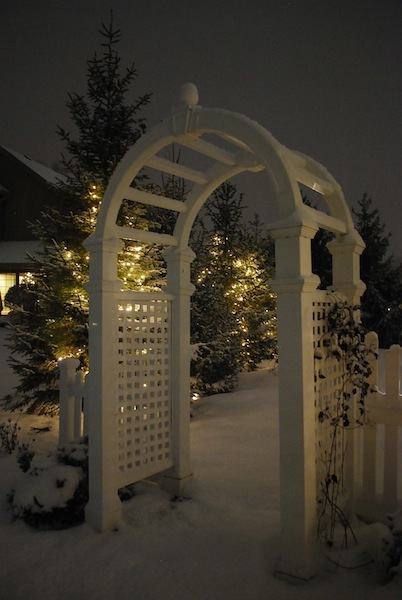 Thought I'd take a few photos to document our outdoor Christmas decor. Pretty simple really, but the snow makes it look more festive. Please excuse the paranormal activity surrounding the lamp post. I wish we could keep our outdoor lights up all winter. We're getting another 2 -3 inches of snow tonight. Think it's time to light a fire. Is it snowing where you are? Wow your home looks beautiful. You're right...the snow looks magical...almost fake looking. So gorgeous. Your home looks so pretty! I love all the white lights in the trees! We got about 2 inches last night and this morning on top of the several inches we have had! It is all prettier with fresh snow! I am over it now that Christmas is over though! I miss my beach!!! These pictures are amazing....your home looks so beautiful. I agree everything looks even prettier in snow, we are due to get some today and I am excited! Wishing you the best in 2013! Carolyn I love your house! These pics are amazing!! Yes the fresh snow always looks so nice. Sooner or later you have to tarnish the freshness. Better before a dog does. Everything looks great. so very beautiful..thanks for sharing!!! We did have a lot of snow last Christmas. That's why we had to keep our outdoor lights on every night, so we could still see how thick the snow was becoming. We had to shovel those every morning to keep our pathway accessible.